We did it! Today Ecosians funded the planting of one million trees in the rainforest. A million trees is incredible stuff, so we want to thank and congratulate you for making this possible. Still, we think Ecosia can do much more. For our next mission, we’re taking the fight against deforestation to the next level by aiming to plant one billion trees by the year 2020. That’s an ambitious new goal, so we had to take a fresh look at our business model. Until now, we always donated at least 80 percent of our total revenue and used the remaining 20 percent to run, improve and grow Ecosia. Starting in the month of November, Ecosia will begin donating at least 80 percent of its surplus (total revenue minus operating costs) to tree planting, instead of 80 percent of its total revenue. The rest of surplus will be saved for big, upcoming impact investments – like launching new Ecosia products. Next to impact, transparency is paramount at Ecosia. 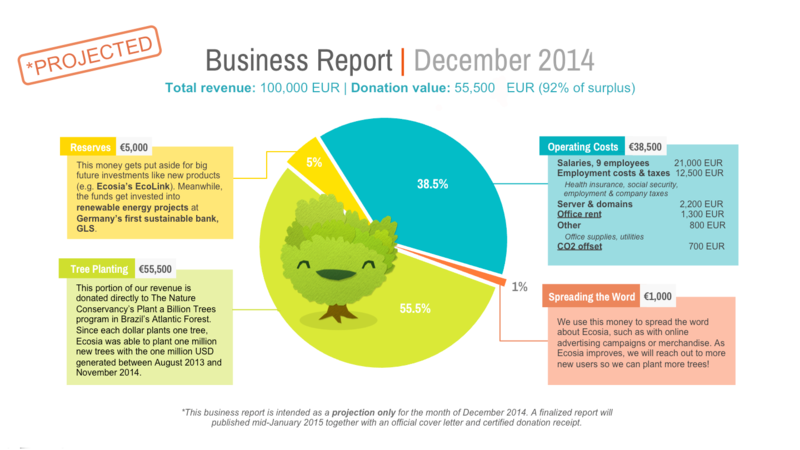 So that you always know how the money is being spent, we will publish business reports every month together with certified donation receipts. Click the image below to expand. With the flexibility to improve, Ecosia will be able to push new features faster, and spread the word more quickly. This will help us grow the Ecosia movement and reach our new, high-impact goal of one billion trees. We’d like to congratulate you on one million new trees for the rainforest! And we’re eager to hear your thoughts and questions, so please share them with us below. You can also join us this Thursday, November 20 at 6 p.m. CET for a live webinar with Ecosia Founder Christian Kroll to learn more about the plan to achieve one billion trees.